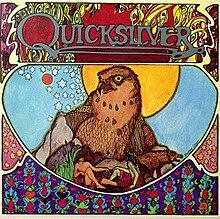 Quicksilver is the sixth album by American psychedelic rock band Quicksilver Messenger Service. Released in November 1971, it was the first album without original members John Cipollina and David Freiberg. Nicky Hopkins had also left at this point to continue his successful journeyman career. Only Gary Duncan and Greg Elmore remained from the original quartet. The album also saw a major decline in sales: whereas their previous four albums had reached the Top 30 on Billboard, Quicksilver failed to dent the Top 100. All songs written by Dino Valenti except where indicated. ^ Eder, Bruce. "Quicksilver > Review". Allmusic. Retrieved August 29, 2011. This 1970s rock album–related article is a stub. You can help Wikipedia by expanding it. This page was last edited on 26 October 2018, at 21:26 (UTC).